Portable wipes in a sturdy and stylish resealable package. Delicately perfumed, clean and refresh the face, hands, and body with delicate scents. The perfect size for travel. Keep a pack in your purse, baby bag, briefcase, or carryon. Keep your wipes moist and ready to use with its reseable package design. Our line of electrolyzed water products brings the Japanese trend of ion water to the U.S. market! Explore these safe, all-natural cleaning and skincare products that offer an alternative to harsh chemicals by using the power of electrolyzed water. Using Marine Collagen and nutrients from seaweed, trehalose (a natural plant extract with moisture-boosting properties), this mask makes the skin firm and smooth. Using Hyaluronic Extract, Trehalose (a natural plant extract with moisture-boosting properties), and marine extracts, this mask deeply hydrates skin and transforms dull, dry skin into a healthy, glowing complexion. Through a specialized treatment using an electrical current and a filter, water is made into a highly acidic form and can be used to kill bacteria, cut grease, and clear skin with no chemical agents. 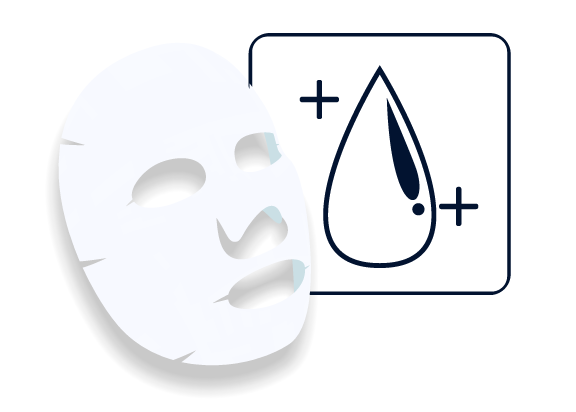 These deep-moisturizing face mask sheets uses strongly-acidic electrolyzed water (pH 2.7) that makes use of the hydrating capacity of water without preservatives and alcohol. Unlike citrus and other acidic chemicals, there is no burning or irritating sensation on the skin. Ultra-high pH water has an astringent effect and can deeply penetrate the stratum corneum to bring moisture to UV damaged skin. Its cooling effect helps relieve sensitive skin. It is completely gentle on the skin, and is made of sheets of soft, natural 100% cotton material. Apply mask to skin for 10-15 minutes while you relax. Optionally, refrigerate mask prior to use for a cooling sensation that tones and firms. Use mask for three days in a row to achieve the full hydrating effect. Antioxidant effect. Avoid the production of reactive oxygen which is a primary factor in cell deterioration. Chemical and fragrance free, free of artificial colors. Free of typical chemicals that may irritate skin or cause an allergic reaction. PH2.7 water attained from electrolyzed pure water. Strong acidic electrolysis water has a sterilizing effect, and is used to disinfect the hands and fingers of doctors and nurses at medical facilities. It is also used to rinse and cleanse endoscope. 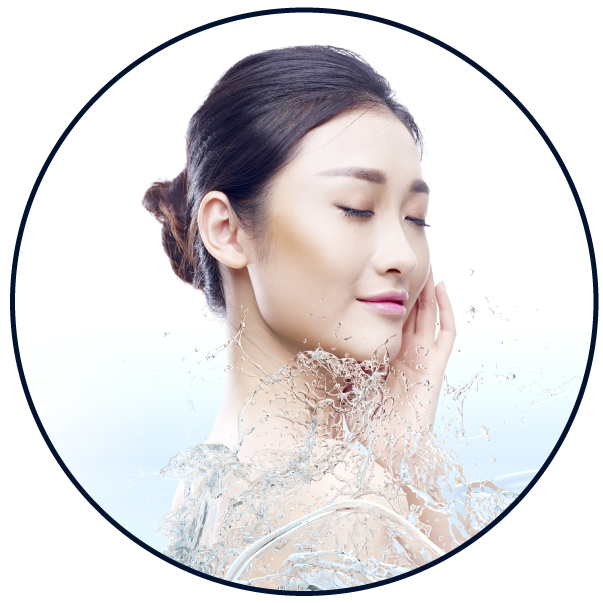 Strong acidic electrolysis water has not been reported to have any side effects or adverse reactions. Effective as an astringent (tightening and maintaining elasticity on the skin) and for hydrating skin. 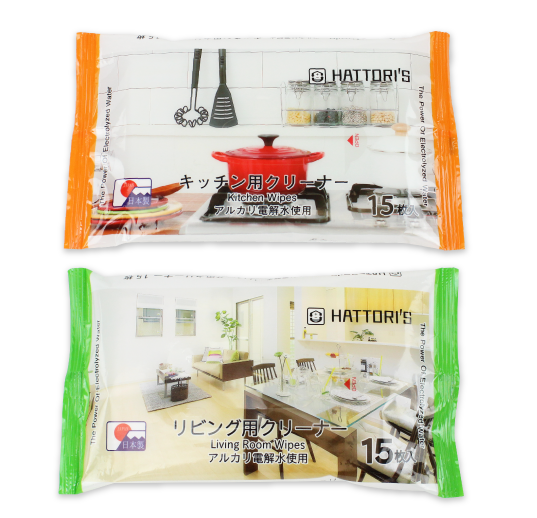 Our Hattori cleaning wipes feature Alkaline electrolysis water. Alkaline water has a pH of 11-14. Using an electrolyzing treatment, water is broken down into hydrogen and oxygen and reassembled. 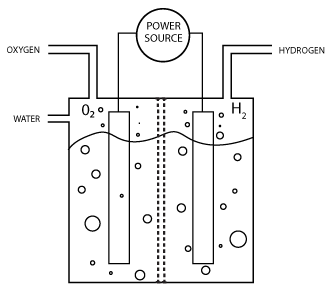 Water that contains a higher density of the hydroxide ion (OH-) generated from electrolysis water is alkaline. Non-toxic & safe, free from alcohols, dyes, and artificial fragrances. Effectively remove grime, dirt, and germs without harsh chemicals. Electrolyzed water is an effective grease-cutting cleaner and sanitizer without the use of artificial and harsh chemicals. Larger-sized cotton rag infused with electrolyzed water. Works with most common “sweeper” mop handles that accept replacement wipes. Does not use any adhesive. How can water be electrolyzed? Everyone knows that water is made of two hydrogens and an oxygen, aka H20. When a water ionizer breaks apart some of those water molecules it produces two types of water: water with a higher-density of hydrogen molecules, and water with a higher density of hydrogen-oxygen molecules. These two types of water have very different pH, making on Acidic and the Alkaline. Both types of water, acidic and alkaline, can be used in different ways. Alkaline water is great for drinking and is thought to balance pH in the body. Acidic water can be used as a cleaning agent to sterilize.